Pulmonary embolism (PE) is the third most common acute cardiovascular disease after acute myocardial infarction and stroke. 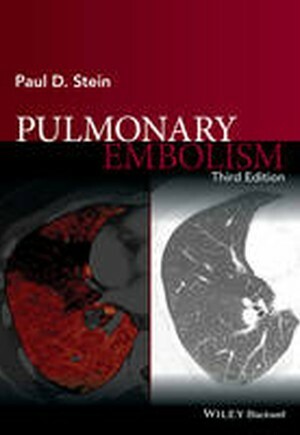 This fully updated third edition supplies the latest information on epidemiology, methods of diagnosis, preferred diagnostic pathways, new medications including the new anticoagulants, and new recommendations for prophylaxis and treatment of pulmonary embolism and its immediate cause, deep vein thrombosis. This book is a dependable and well referenced resource for in–depth information about pulmonary embolism (PE) and deep venous thrombosis (DVT). Paul D. Stein MD,Professor of Osteopathic Medical Specialties, College of Osteopathic Medicine, Michigan State University, East Lansing, Michigan, USA. Dr. Stein′s major research in recent years has been in the field of venous thromboembolism. Dr. Stein initiated the PIOPED II and PIOPED III national collaborative studies and was national principal investigator and chairperson of the steering committees. He has written over 240 articles on venous thromboembolism from among over 560 peer reviewed articles. Dr Stein is a past president of the Laennec Society and of the American College of Chest Physicians. He is Fellow of the American College of Physicians and the American College of Cardiology and a Master Fellow of the American College of Chest Physicians. He is also a Fellow of the American Society of Mechanical Engineers. Fellowship is reserved for those who have made a significant contribution to the field of mechanical engineering. He received the Lifetime Achievement Award from the American Heart Association Midwest Affiliate, the Laureate Award of the American College of Physicians, Michigan Chapter, the Daniel Drake Award from the University of Cincinnati College of Medicine, and the Research Excellence Award from the Michigan State University College of Osteopathic Medicine. Dr. Stein also wrote a book, A Physical and Physiological Basis for the Interpretation of Cardiac Auscultation: Evaluations Based Primarily on Second Sound and Ejection Murmurs.